I’m having a strange problem with controlling an Alnitak flat panel. I have two scopes, one mount and 3 cameras. With my equipment I have created 11 equipment profiles. 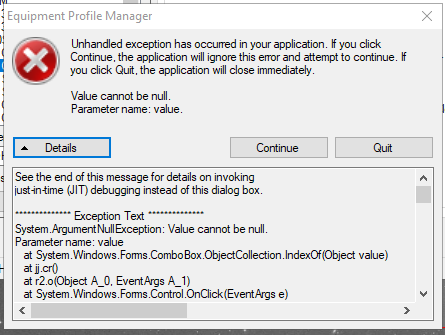 The problem I can’t figure out is that with 4 of my equipment profiles I get an unhandled exception (see below) when trying to open the Alnitak settings, and the same thing happens with any sequences created from those 4 profiles. However, I can open the settings just fine with the other equipment profiles and sequences created from those profiles. I can also get to the settings if I just open SGP, choose the Alnitak Flat box and connect. I simply cannot find any difference between the problematic profiles and the working profiles that would cause this problem. I’m dumbfounded. I had a similar issue some time ago and recreated my profile from a working one. I re-created the problem profiles from working profiles and all is well. It’s just strange that those profiles didn’t work with the flat panel for no obvious reason.